Surveys estimate almost half of the adult population have had a headache at least once within the last year. Of those cases there are many different types of headaches, all having varying causes and severity. Headaches caused by my posture? There are a group of headaches that have one thing in common. An alteration of blood flow to the head resulting in pain. The fundamental cause of a headache can vary and sometimes requires serious Sherlock Holmes’ sleuthing techniques to figure it out, as therecan be multiple causes. In this article I only want to discuss how poor posture can cause headaches from a functional and structural perspective. The most honest answer to the question “are headaches caused by my posture” is yes. Poor posture is not the only thing that can cause headaches, so see a health expert for assistance. That being said, let’s say you have poor posture. Your poor posture is creating just the “right” environment to create a headache. By correcting your posture you could cure yourself of your headaches. Let’s break down some of the anatomy of the head and neck to better understand how poor posture causes headaches. Your head, which connects to your cervical spine (neck), is balanced through a series of muscles, ligaments, tendons and receptors. In stillness or in motion they keep the head in a healthy position. Through injuries and accidents the tissues surrounding the joints in the head and neck can become weak, tight or unstable. Poor posture that creates headaches can appear in two ways: forward head posture and poor alignment. 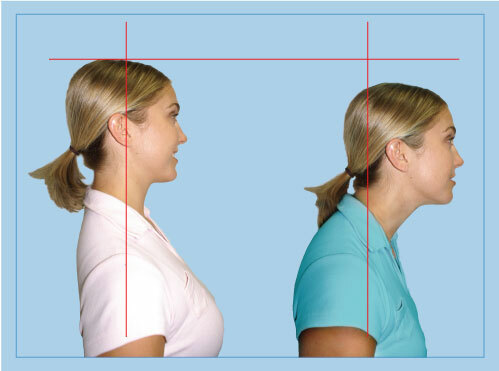 See this article for deeper explanation – Forward Head Posture. As you can see from the posture below, the head on the right has moved forward as if it is jutting out from the body. This is a very common presentation of poor posture in the head and neck anatomy that leads to the dysfunction described above. Muscles attaching to the skull and neck are called suboccipital muscles. in Forward head posture these muscles are affected. Suboccipital muscles shorten and the muscles of the front of the neck are typically found to be lengthened. An often overlooked component to headaches is poor alignment of individual vertebrae of the cervical spine. Poor posture will cause fixation and misalignment of the upper cervical spine. As a result both distort neck muscle, impinge nerves and reduce blood supply to the head. One should have the area of the first through third vertebrae of your neck evaluated by a professional. If there is poor alignment and motion in these segments it could be a major factor to your headaches. Many people suffer from headaches and if you’re one of them, you can attest to how much it can affect your daily life. The good news is poor posture is a major cause to headaches; correct your posture and the headaches will go away. Headaches are complex and serious conditions are possible. Once you have ruled out the more serious causes to your headaches, consider looking at your posture.